Immunogen: Recombinant rat NGAL precursor. Scientific Background: Rat lipocalin-2 is also called rat NGAL, as it is the ortholog of human neutrophil gelatinase-associated lipocalin (NGAL). Rat NGAL is a 25-kDa alpha 2-microglobulin-related protein or neu-related lipocalin. It is expressed by neutrophils and various epithelial cells, including cells of the renal proximal tubules. It is involved in physiological processes such as the binding of siderophore iron and tissue growth and regeneration. It is upregulated in a variety of pathological situations including infection, inflammation, ischemia-reperfusion and in certain adenocarcinomas. 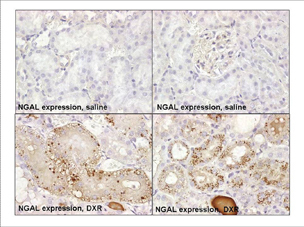 Immunohistochemical analysis of kidney, formalin-fixed, paraffin-embedded tissue sections of cortical epithelial cells in the S1/S2 segments (proximal convoluted tubules) following DXR-induced acute kidney injury stained with NGAL (rat), mAb. Top panel, saline treatment; bottom panel, DXR treatment; X630.